New Learning Academy was founded in 1998 and is a school which is dedicated to language teaching. One of our strongest language programs is Spanish. The necessity to understand and speak the Spanish language is constantly growing, for business, travel or leisure. That’s why we consider it a privilege to enhance the communication skills of anyone who has the desire to learn a second language. Besides offering our specialized Spanish programs we also have programs in Italian, German, French, Portuguese, Mandarin, Japanese and English available. We pride ourselves on consistently personalized attention in a warm and friendly atmosphere. Our teachers have University degrees; they are selected on the basis of their teaching experience and their outgoing personalities. They provide a positive classroom environment that will make you feel comfortable. 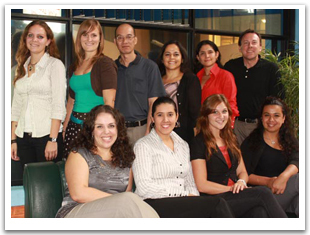 They are excellent at facilitating and eliciting conversations, and are Spanish experts for all your questions. At New Learning Academy in Costa Rica, we are proud of our teachers, all of whom are college graduates with extensive experience teaching Spanish as a Foreign Language. Our methodology is based on the communicative approach, emphasizing listening, and speaking skills. Reading and writing skills are also taught depending on the learner’s individual needs. The classes are well organized, and follow a daily lesson plan. Our goal is to enable you to communicate effectively in Spanish in real life, with hands-on experience in daily situations that you will encounter during your stay in the country. We also offer a program with conversation partners; these are native Spanish speakers who are willing to exchange conversation time in both Spanish and English. You can help them improve their English, and they’ll help you enhance your Spanish skills as you learn about Costa Rican life. Our Guadalupe school is located 15 minutes from downtown San José, the capital of Costa Rica. We provide information on restaurants, nightlife, and current festivals and activities in the metropolitan area. Our school is situated in an outdoor mall, which gives our students security as well as a close proximity to many other places, like supermarkets, restaurants, etc. We invite you to discover our country’s natural beauty and peaceful environment while studying at New Learning Academy. I am interested in finding a job teaching English in Costa Rica. My name is Alice Dunn and i am a TEFL qualified English teacher from England. I wondered if you have any vacancies? I currently do not speak Spanish but i moved to Costa Rica with the intention of learning and therefore your institution is perfect for me. I know of 3 other native speakers looking for jobs so if there are multiple positions available please could you let me know so i can ask that they send their CVs also.